The solution to register all Fonts from a Folder without install to use the Fonts in other Windows Programs, is in FontViewOK very easy at Version 4.07! First, list the not installed fonts from an folder, in FontViewOK. see FAQ-1: ... view (show) the not installed fonts! Do a right mouse button click, in context menu simply select the option "Register all without install"
If you want to register only a few specific fonts and may not all, you now simply package them in a separate folder and then open the folder and register all there. (Image-1) Register all Fonts without install and use Font! 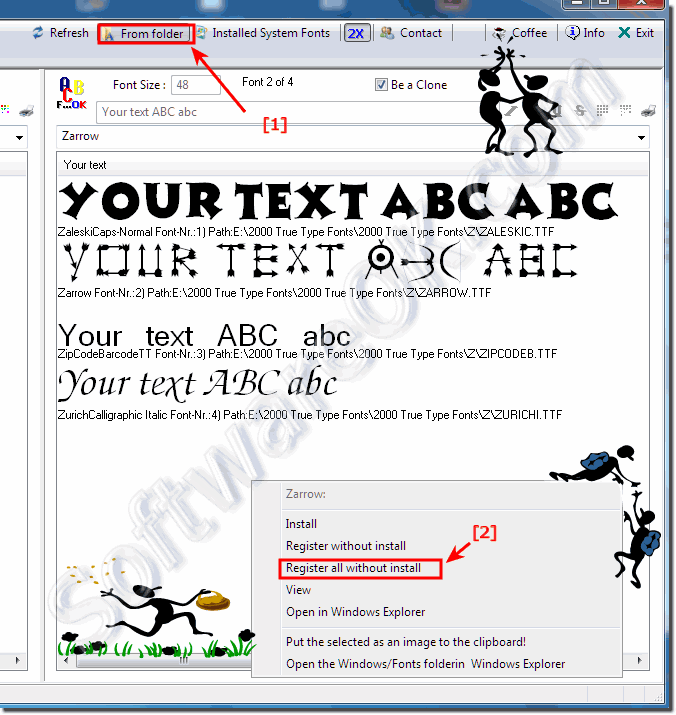 FontViewOK - FAQ-4: Register all the fonts without installation, for other Windows programs, how to? How to Use a Font Without Installing it on Windows 10?